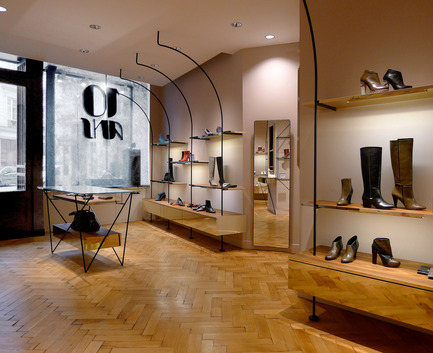 Paris, France, 06-02-2012 - In spring 2011, the shoe designer Karine Arabian reopened her signature boutique at 4, rue Papillon in the 9th arrondissement of Paris, unveiling a newly redesigned space in keeping with the brand’s new architectural identity, both the work of interior architect Joseph Grappin. Classically Parisian in style, the boutique now features a façade with lovingly restored mouldings and an authentic herringbone oak parquet floor. 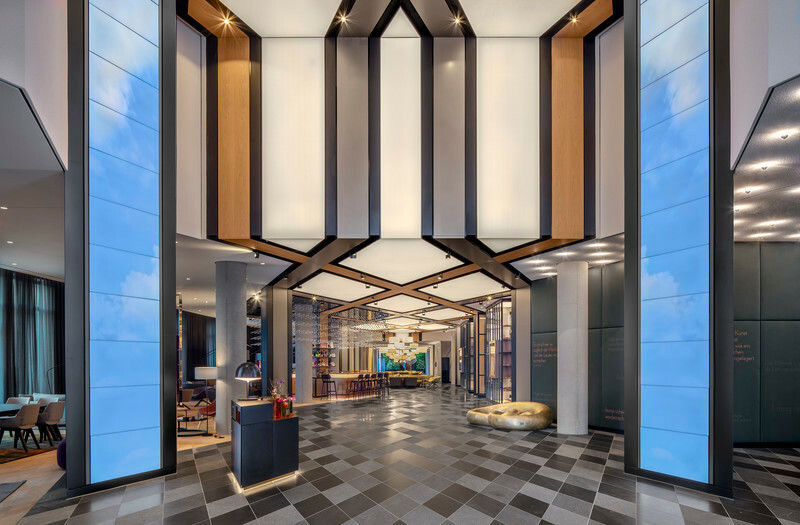 The redesigned space is home to an innovative display system for shoes and other leather goods, conceived in the form of modules that are then tailored to specific sections of the space. Attracted by the technical qualities of sheet metal, inspired by the ways in which elegance first rhymed with functionality in the pioneering uses of this material by Pierre Chareau and Mathieu Mategot, Joseph Grappin has developed a unique structural principle embodied by vertical arching metallic uprights that unify the entire design. 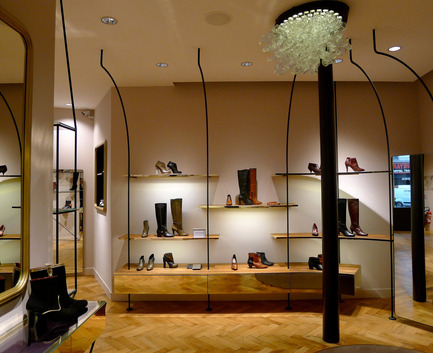 The linear and curvilinear aspects of these uprights serve to frame the space and draw customers to the areas of the boutique, reminiscent of garden pavilions or kiosks, dedicated to trying on Karine Arabian’s singular shoe creations. 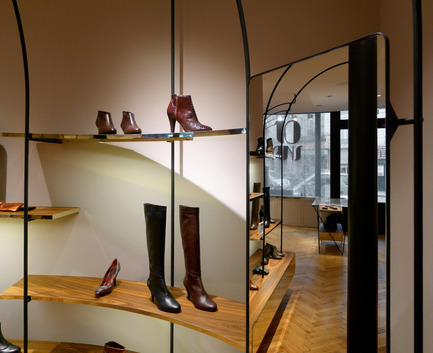 These metallic elements are fittingly complemented by the display shelves crafted in luxurious Brazilian rosewood and installed in a staggered fashion, the mirrors and the screens enhancing the intimacy of the customer’s shopping experience. Other essential accessories, celebrations of femininity emblematic of the mix of style and elegance that has always characterised the designer’s creations, are also displayed to their best advantage. The whole project is built around the special characteristics of the sheet metal used for the structural elements. 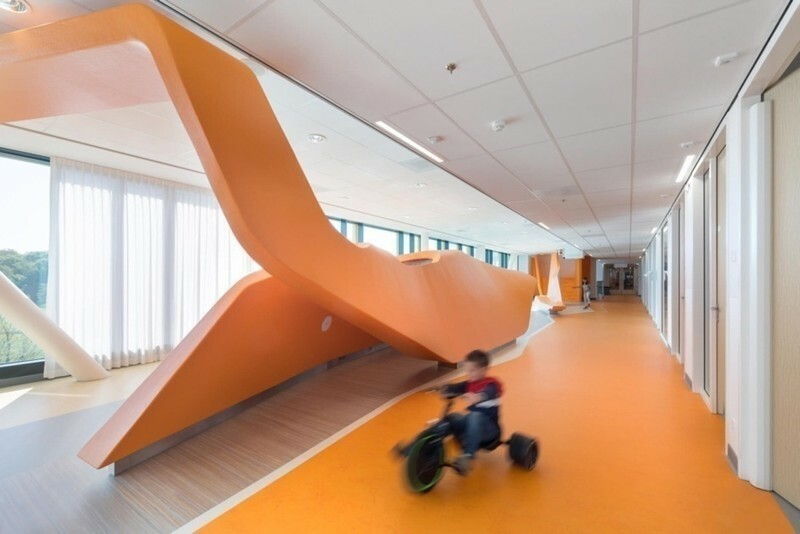 These technical qualities allow for the creation of the narrowest of uprights creating an impression of openness, accentuating the feeling of lightness, as if the entire display system were floating on air. The unifying thread is a thin metallic line, functional and black, charting the space, traced across and joining all of the shelves, windows and display cases. 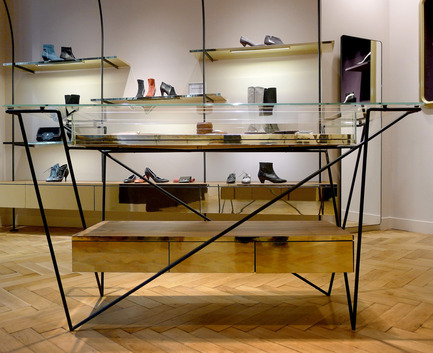 The folded steel sheeting used as the base of the cantilevered cashier’s counter set off to the side to free up floor space also adds to the weightlessness of the design. In a palette of muted colours, a set of upholstered furnishings soften the atmosphere and underscore the contrasts of colours and materials. 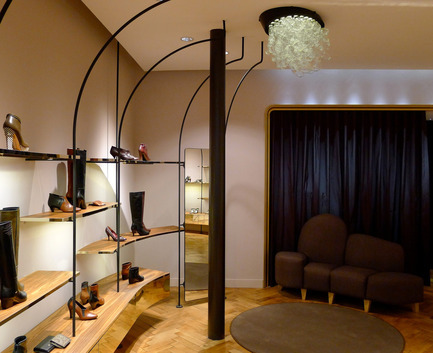 Two comfortable sofas consisting of a grouping of large cushions especially designed for trying on shoes foster the intimacy of the kiosk-within-a-store concept for these two areas of the boutique. 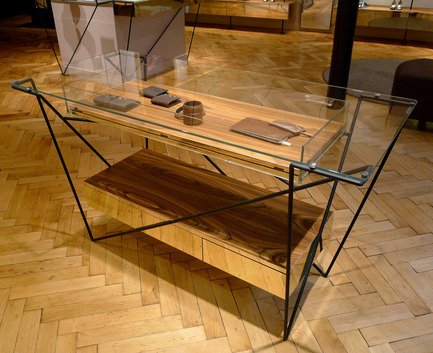 The drawers and display niches for small leather goods are lined in dark velvet. A theatrical curtain made of a fabric worthy of an evening gown, a black taffeta accented with aubergine moiré, separates the selling space from the section of the boutique reserved for personnel. To lend a special ambiance to the kiosk areas, which work as points of reference within the space, instilling a feeling of ease and intimacy for trying on shoes, Karine Arabian wanted to add an organic and magical touch in the form of hand-blown glass chandeliers created by the artist Julie Legrand. 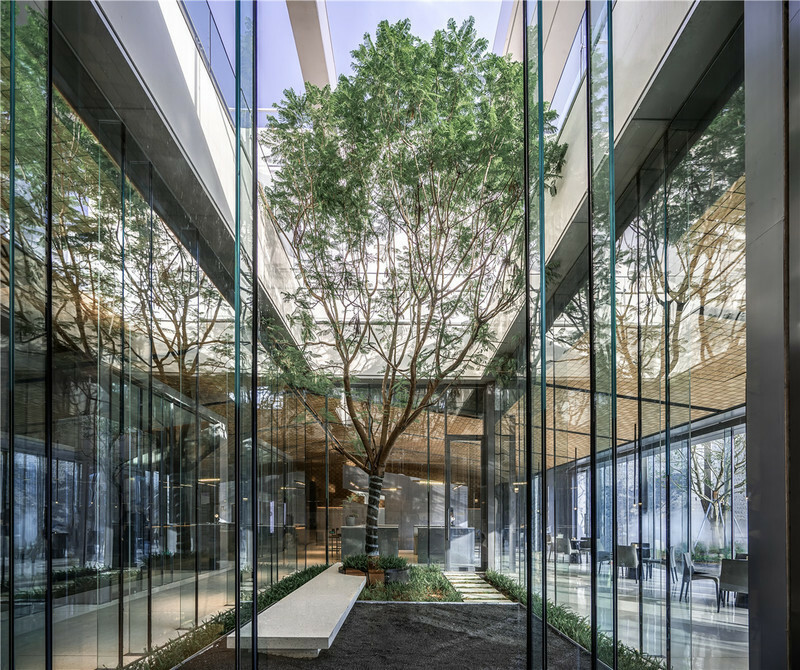 Each piece of glass calls to mind a soap bubble captured in its fragile growing phase, the whole effect shimmering like the tiered petals of an aquatic plant over the centre of the kiosk areas. 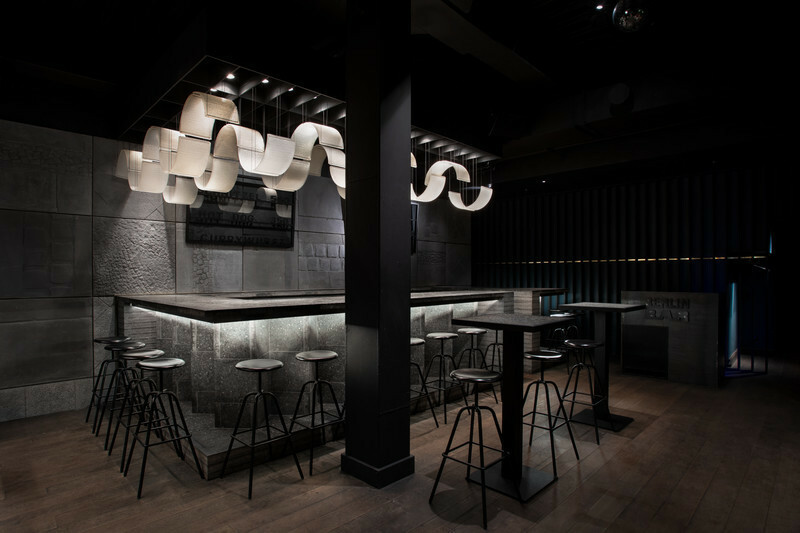 In all, the concept creates a boutique marrying modern functionality with classical simplicity, elegance, comfort, but also the unabashed interplay of lines and materials. 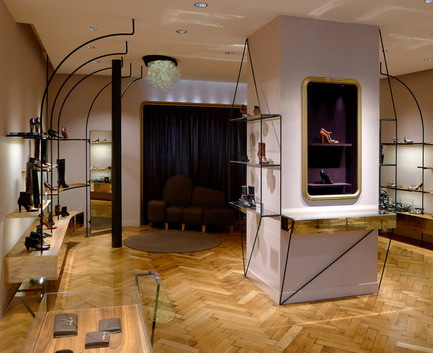 Upon entering, customers immediately feel at home, as if they were being welcomed into the comfort of a Parisian salon, emboldened to channel their inner Narcissus and admire their new look in a perfect pair of pumps. • Karine Arabian brand. Chandeliers commissioned by Supervision/Sophie Brossais and created by the artist Julie Legrand. 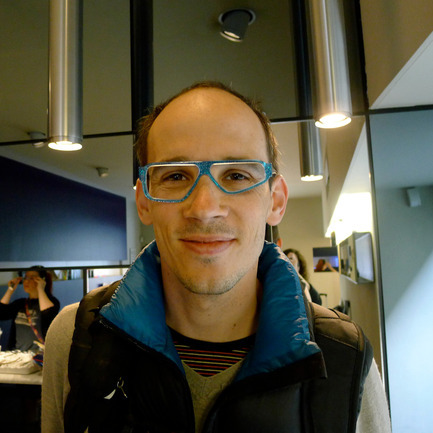 Born in 1976 in the Burgundy region of France, Joseph Grappin lives and works in Paris. A 1997 graduate of the Ecole Nationale Supérieure des Arts Appliqués et des Métiers d’Art (ENSAAMA), he went on to study at the prestigious Ecole Boulle, receiving its advanced diploma in interior architecture in 1999. 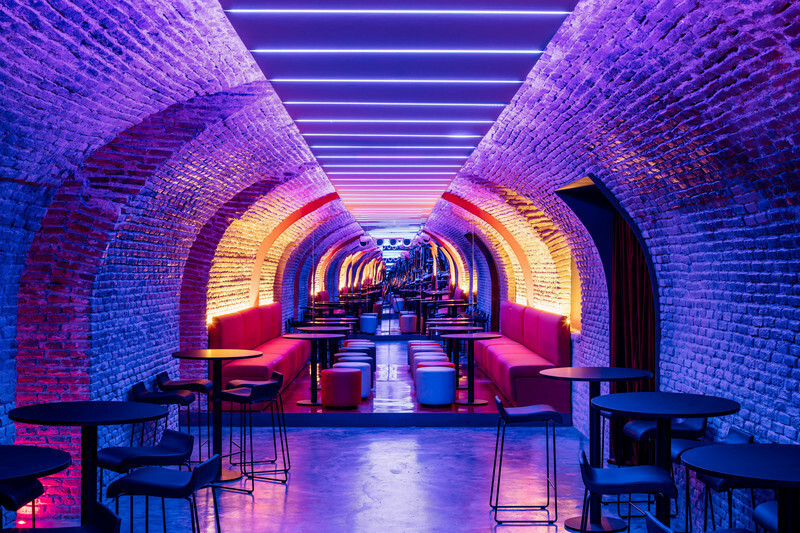 He has worked on projects with a number of prominent architects, including Karine Chartier and Thomas Corbasson, Patrick Rubin and Annie Le Bot, the Plan 01 group, as well as the designer Christophe Pillet. 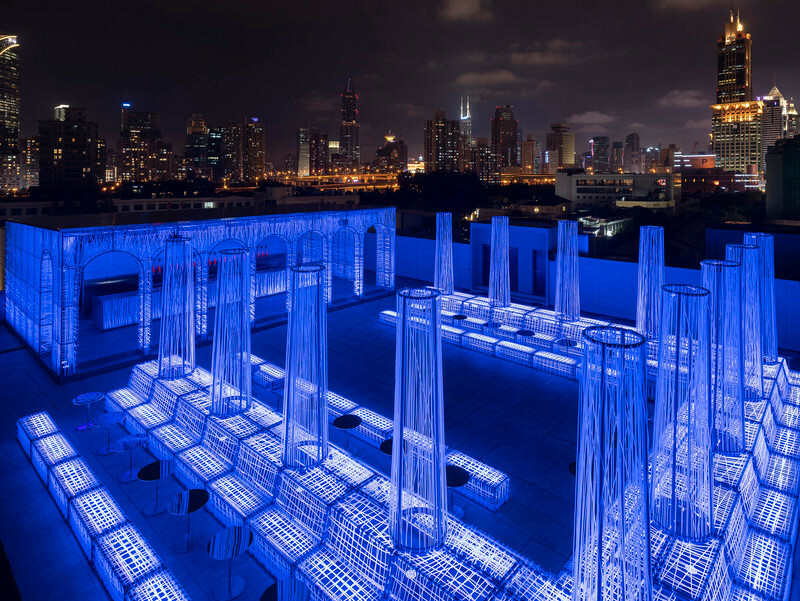 Joseph Grappin founded his own interior architecture agency in 2007 and has since developed projects for a wide range of clients. 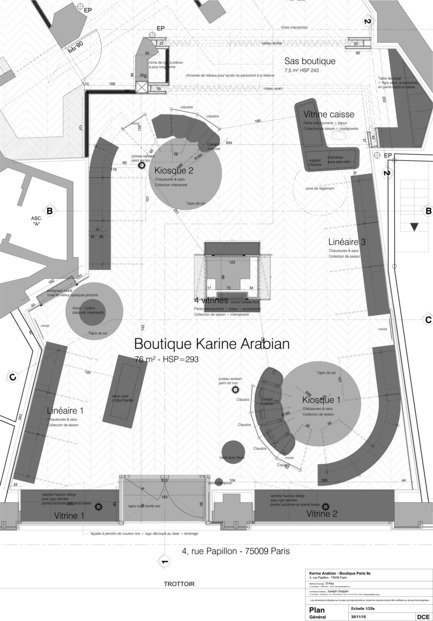 Creation by Joseph Grappin of a new architectural identity for the Karine Arabian brand. Creation of a loft apartment in a recently built property at the hear of a residential neighbourhood in Montfermeil, a Paris suburb. 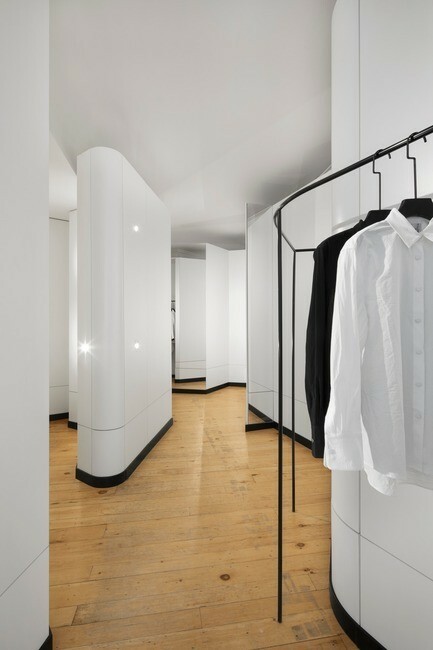 Renovation and redesign of a apartment fitted out in the manner of a hotel room with all the usual accessories. Rehabilitation and conversion of unused commercial premises into an art gallery comprised of two exhibition rooms, a meeting room, a receptionist's office and a storeroom. Design of built-in furnishings. Design for the interior of an independent, local bookstore and its modular shelving system. 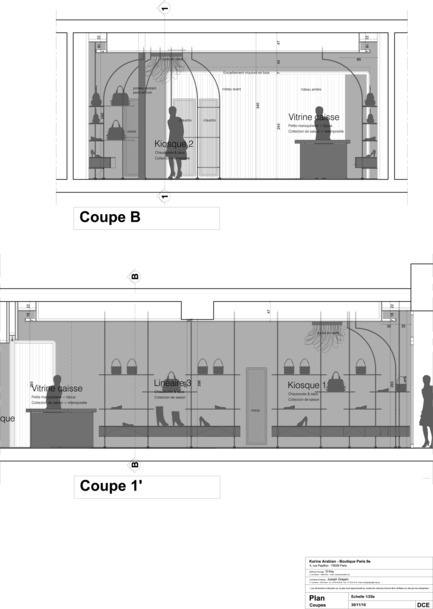 Interior design project for the Japanese cosmetics brand’s Paris flagship store. 2007 Foyer Saint-Jacques - Paris 14ème / Project in collaboration with Patrick Rubin & Annie Le Bot / Canal. 2004 Crédit Municipal de Paris - Paris 4ème / Project in collaboration with Atelier du Pont Architects. 2004 Maison de l’architecture, Couvent des Recollets - Paris 10ème / Project in collaboration with Chartier Corbasson Architects.